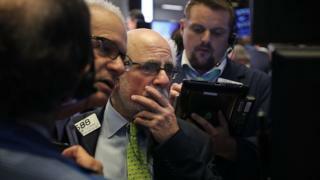 A sell-off on Wall Street continued on Tuesday, amid steep declines in oil prices and losses among technology shares. The Dow Jones Industrial Average shed 550 points to close 2.2% lower, weighed down by Apple, whose share price plunged by nearly 5%. The broader S&P 500 dropped 1.8%, while the tech-heavy Nasdaq index fell 1.7% to its lowest level since February. Meanwhile, benchmark oil prices sank nearly 7%, close to one-year lows. Connor Campbell at Spreadex described the sell-off as a "macro-car crash, with Brexit fears, the post-Apec pre-G20 US-China trade war flare-up and the continuation of a nasty US tech sell-off resulting in absolute carnage". It also reflects underlying concerns about slowing global growth, according to Nariman Behravesh, chief economist at IHS Markit. In the US, a robust economy had so far largely shielded stock markets from some of those worries. However, Mr Behravesh said investors now expect a boost from tax cuts and increased government spending to fade. "This stimulus will wear off by late 2019 and early 2020, and the US economy will join the others in seeing a significant loss of speed," he said. What spooked investors on Tuesday? US retailers were punished for weak results and forecasts, with shares in Target sinking 10%, while Kohl's tumbled 9% and Walmart was dragged almost 3% lower. Analysts at Goldman Sachs cut their price target for Apple shares from $209 to $182, blaming very weak demand from China in the late summer as well as a stronger US dollar. Michael O'Rouke at Jonestrading said retailers as well as big technology firms such as Amazon and Facebook had pushed the market higher for most of this year. "Now that's fading, so people are more apt to take profit and de-risk going into the year-end. There are the headwinds of the trade war out there. The fiscal stimulus from tax cuts is starting to fade ... we don't have many positive catalysts," he said. The balloons will soon be inflated for the Thanksgiving Day parade just as the air seems to be coming out of the US markets. Tuesday's sell-off seemed to be sparked by disappointing earnings from several retailers. Aside from that, Wall Street traders offered up several reasons for the recent volatility. One was President Trump's trade war with China. Any escalation could hurt US and Chinese companies by raising production costs and the price for consumers. Another was the prospect that America's central bank could raise interest rates to combat inflation and stop the economy from overheating. This makes it more expensive for companies to borrow and invest. Whatever is behind the latest stock market gyrations, it's worth remembering that the current bull market is the oldest in history. For months some have warned that the US market is overvalued. In which case what you may be witnessing is a shift as investors move from chasing yield - financial jargon for the return on their investment - to managing risk. What impact will this have globally? The US market falls extended declines in Europe. In London, the FTSE 100 index slipped back below 7,000 points. The DAX index in Frankfurt fell 1.5%, while in Paris, the CAC 40 was 1.2% lower. IHS Markit said the market swings are starting to hurt business sentiment and capital spending. But analysts at Oxford Economics said they think the effect on consumer spending - the biggest economic driver in the US - is likely to be relatively muted. The firm wrote: "This doesn't mean the economy is insulated from stock market movements, but rather that so long as those movements don't excessively weigh on confidence, employment and income, consumers can be expected to continue spending." What will stop the fall? Since market turmoil emerged in earnest in October, all three major US indexes have largely given up the gains made earlier in 2018. Oil prices for the major benchmarks are also down about 30% since last month. On Tuesday, Brent crude fell by 6.5% to $62.58 a barrel while West Texas Intermediate shed 6.8% to $53.41 a barrel. Hans Redeker at Morgan Stanley commented: "For the US equity market to stabilise, either the rest of the world will have to show better growth or the Fed will have to moderate its stance."